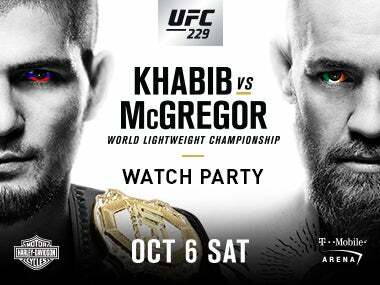 On Saturday, October 6, Golden 1 Center will host an exclusive closed-circuit viewing party for the highly anticipated clash between Khabib Nurmagomedov and Conor McGregor. Fans will be able to enjoy the premium clubs located inside the arena. Golden 1 Center food and beverage will be available for purchase during the fights. Golden 1 Center insiders and Kings Season Ticket Members will have an opportunity to purchase presale tickets for $10 beginning Friday, September 28 at 10 a.m. at Golden1Center.com – with a presale code. Limited tickets will be available for purchase beginning Saturday, September 29 at 10 a.m. Tickets are $20, and guests will be able to watch the full fight card from Golden 1 Center’s courtside clubs. Doors will open on Saturday, October 6 at 6:00 p.m. with the fights beginning at 7 p.m.